Landscape: Compared with the Camino Frances, the Portuguese Route is much flatter with barely any serious elevation gain, making for an easier walking experience. The pilgrim travels through beautiful rural countryside, passing terraced vineyards, woods, farms, tiny hamlets and small villages. Parts of the walk are along paved roads which can be hard on the feet. The pilgrim has to be vigilant when walking on the main roads, particularly when approaching the large towns and cities. Duration: Normally takes from 4-8 weeks depending on your chosen pace, or your fitness levels. Some pilgrims may do it in a shorter time due to the flatter terrain. Route: Sometimes called the Royal Route, made famous by Queen Isobel of Portugal’s pilgrimage in the 12th Century, the walk from Portugal to Spain begins in Lisbon and ends in Santiago de Compostela. 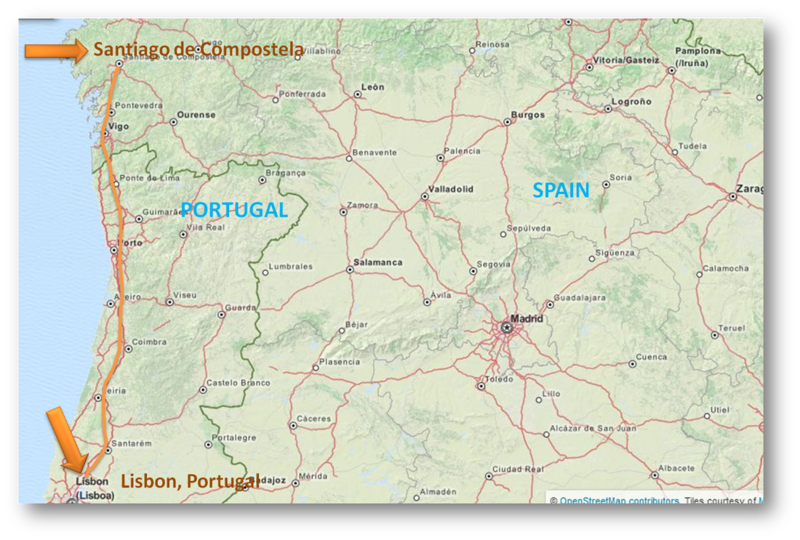 It is a largely rural route that passes through the main towns of Santarem, Coimbra, Porto and Vigo, before ending in Santiago de Compostela. A Visit to Fatima: Along the route, you will have the opportunity to take a detour to Fatima, the place where in 1917, three children were purported to have been visited by the Virgin Mary on three separate occasions, and where they received instructions on how mankind ought to right their wrongs if war and famine were to be avoided. There are sign-posted roads that lead out of Lisbon and also out of Porto. Sign-Posting: The route is quite well-marked, though many who walk it say the pilgrim has to be much more vigilant in looking for markers than when walking the Camino Frances. Accommodation: Until Porto, accommodation consists mainly of B&B's, hotels and pensions. Firefighters are known to provide space on the floor of the fire stations if pilgrims are on a tight budget and need shelter, but this is not always possible. After Porto, there are plenty of albergues available. This guide will give you a general idea of the weather and conditions that you can expect on the camino at different times of the year.